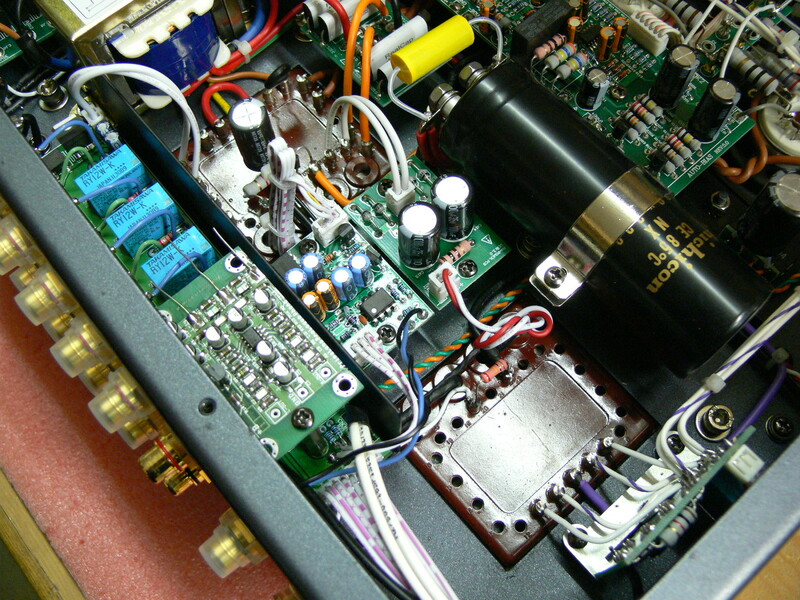 Looking at the pictures of the inside of the DiaLogue Premium Integrated Amplifier makes me think of our AH! Njoe Tjoeb cd player. 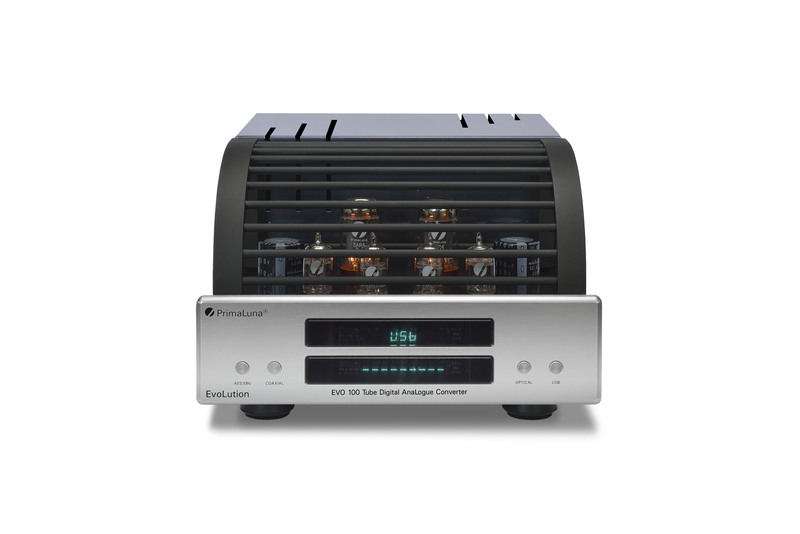 While it started off as a good quality cd player with tube output stage we added step by step different options. In the beginning a player with lot of space, in the end a player (if all options were used) with almost no empty space left. Certainly if 3 Super Tube Clocks and an extra transformer to supply these, are added. Same thing we start to see here in this amplifier. We decided to say goodbye to the good old Tape Output to make space for a Sub Out. Personally I don’t know a lot of people who use a sub, but in USA it seems to be almost as normal as a pair of main speakers. If you look at the picture you see near the backside of the amp the PhonoLogue board for which we found a new mounting system (the PhonoLogue is not connected, it is just mounted). Next to that you see the new board for the sub out and behind that the special power supply for the PhonoLogue. As I already said, it’s getting fuller and fuller inside there. We also found sonic improvement by moving the UL/TR relay switch board closer to the output transformers. The OTP has now been integrated on the UL/TR relay switch board. I still prefer a tape output for connecting a nice headphone amplifier. Maybe a dedicated full tube PrimaLuna headphone amplifier instead? Sorry for delay in answering. We have not implemented a low pass filter for “Sub out” as in most subwoofer already a low pass filter is already used. It is a special circuit, not just a re-labeling of tape-out. No it cannot be used as pre-amp out. Sorry about that. No worries about the delay, you were in China, and it’s rare to have manufacturers answer so many questions, so thanks, Herman! What do you mean by “special circuit”, is it not just a standard pre-out? Is it a single mono RCA, or a double? Single mono RCA. With special circuit I mean a dedicated pcboard for this. It is the middel of the 3 small one you can see in the picture above. Thanks Armin. We are just back from China checking parts and production. We could make some last minute software changes. Now the amp remembers the settings from before switching off. Good for us old guys. I’ve found today this post. I’m a very happy owner of a Prologue premium Integrated and it’s a pleasure listtening to it paired to my Stirling LS3/5A, but for family’s “mental health” I often switch to my Sennheiser HD800. 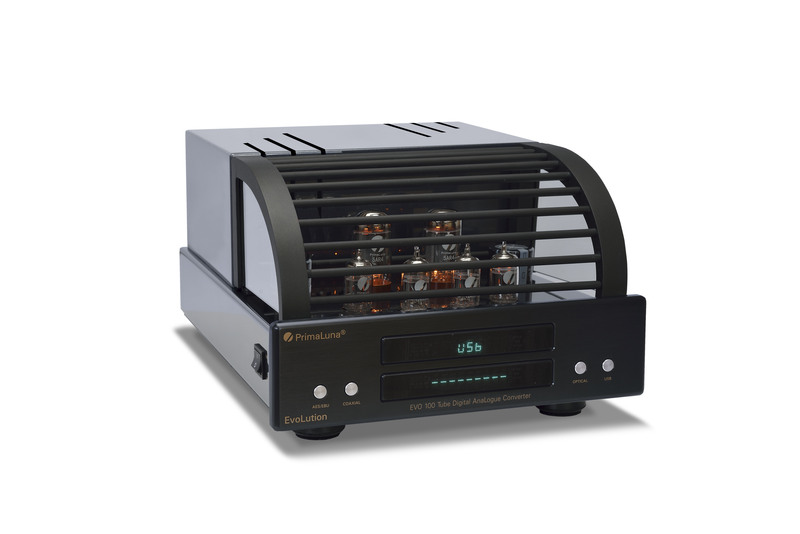 I use a dedicated Musical Fidelity amp, but this can seems to be born for tubes. is there any way to connect them to Prologue, maybe with a capacity resistor connected to speaker out? Thanks a lot and my compliments for this beauty of an Amp! Dear Roberto, I would love to help you out, but simply do not have the time ánd it’s the job of the dealer you bought the amp from and who certainly will be able to help you. Just saw this post today. Can you please clarify 1 thing on the post above for me? In the Dialogue Premium Integrated, is there a PhonoLogue board installed but not connected? Is it applied to all units manufactured so far? Thanks for asking. No, just in this picture :-). Sorry.